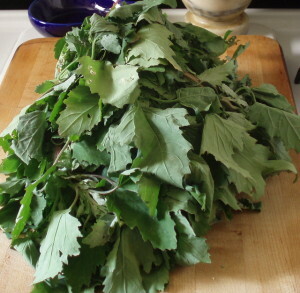 We’re seeing a revival of interest in cooking greens, which delights me. 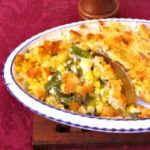 They all taste different, they work well as a side dish or an ingredient in something else, you can use a simple, basic recipe to make many very different tasting meals. 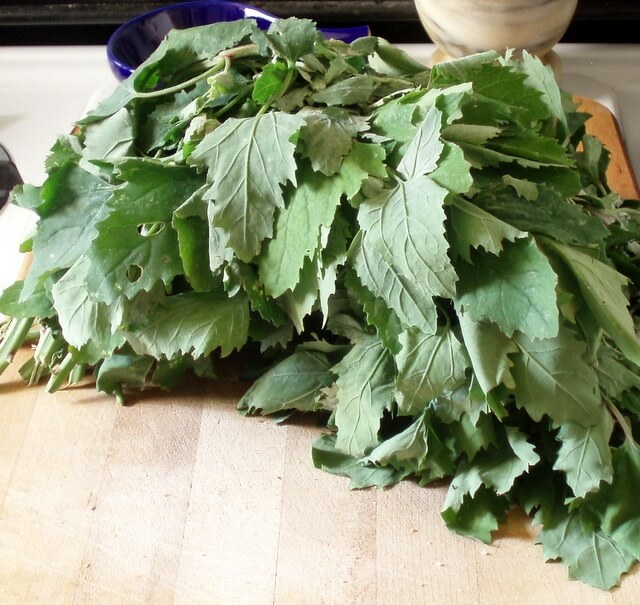 Historically, Europe in the Middle Ages did not have many of the vegetables we are used to – many are New World, and some had not yet been developed – but I have seen a recipe telling the cook to take any assortment of more than a dozen different greens! Clearly one would choose them by season and taste – spring spinach is very different from kale that’s been frozen in a garden (frost makes it sweet…) and I don’t even know what lovage and tansy taste like! The crucial concept to remember is that you need to wash them well. Even if they have been prewashed, some sand or grit may be caught in the leaves, and you don’t want that on your plate! And just putting them in a collander and rinsing, while better than nothing, still sometimes leaves some grit trapped. 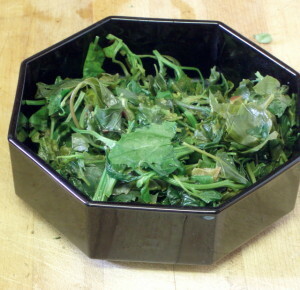 The best method is to put greens in a sink (or bowl) full of water, and then lift them out. 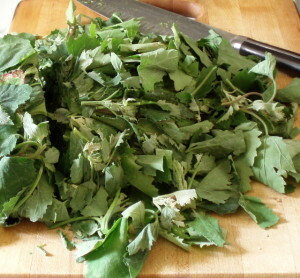 I usually chop the greens first, which is a good chance to remove woody stems. (I tend to cook and eat any stems that aren’t actually woody or stringy – you may choose not to.) It’s also a good time to pick over the greens, removing yellowed or wilted leaves, or anything that seems not quite right. Then I put them in the sink. Well, actually – since my sink doesn’t have a plug, and is quite large – I use a big steel bowl to wash vegetables. I fill it with cold water, and add the chopped greens. (If you want to use a vegetable wash, this is the place to add it.) 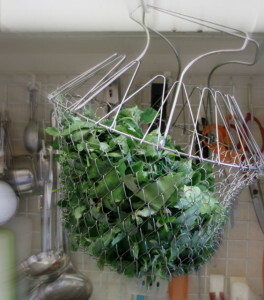 I use my hand to swish the greens around in the water, then lift them out and put them in a collander or strainer basket. The lifting is the most important stage – that’s when the leaves come out and the dirt stays behind. If the water is very dirty or gritty, or if I used a wash, I then repeat the process with another bowl of fresh water, to rinse. While the leaves are drying, I heat a large pan. 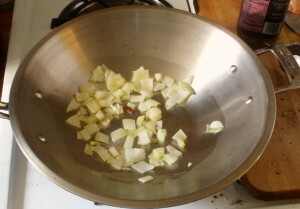 (I like a big stainless steel wok – plenty of surface, plenty of room.) A big frying pan works well, or a saute pan, or even a 4 quart soup pot. I heat a little olive oil in it, which will be tossed with the greens, start them cooking down, and help prevent sticking. I also often add aromatics of one sort or another – onion, garlic, leeks or other aliums, peppers (sweet or hot,) celery, herbs or spices. These add flavor, and can change the mood of a vegetable. In this case, I just put in a little onion, and sauteed it until it was soft. Then, I added the lamb’s quarters. By now, they were mostly dry, with just a little moisture. The goal is to have a few drops of water to help create steam – but not enough to puddle in the bottom of the pan. Yeah – sometimes I have too little (and add a splash) or too much and end up cooking away water… it’s not an exact science. But you want the leaves just a bit moist. If you have more than easily fit in the pan, that’s OK – just put some in, and add the rest later when there is room. I use tongs to toss them around in the pan. This helps distribute the oil (and onion) and the water, and start the greens wilting. As I toss them, they will start shrinking, and now I can start adding any extra that didn’t fit. It’s astonishing how much less room cooked greens take than the raw ones! 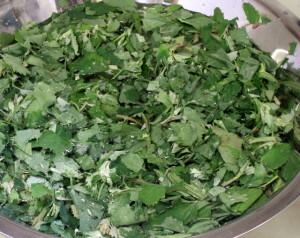 The color will change, also – they will become a much darker green as they cook. 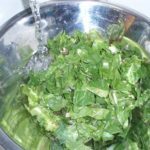 This is my basic method of cooking almost all greens – from spring spinach through kale and beet greens. I even cook baby collards this way, though I do prefer a different method for mature collards, and some mustard greens. (I think they’re a bit tough, cooked this way.) And it was perfect for the lamb’s quarters. Chop the greens, and pick out discolored or tough bits. Place the greens in a sink full of water. Swish them around to wash them, then carefully lift them out, to leave any grit or dirt behind. If the water is dirty, repeat the process. 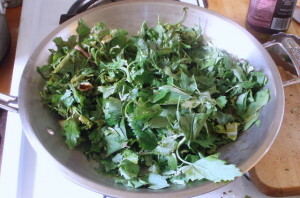 Drain the greens in a collander or strainer, until almost dry. Heat oil in a saute pan or fry pan. Add the onion, stir, and saute until softened. 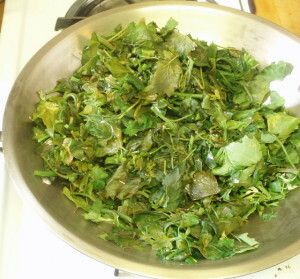 Toss them again every few minutes, bring the more cooked greens on the bottom to the top, until cooked to taste. I love your colander! Thank you for linking up your very detailed tutorial with Shop Local :) I've never tried Lamb's Greens - I wonder if they will ever make an appearance in my veg box. Laughing at "very detailed..." I always feel a bit silly writing this much - but then I remember that these are things I learned over time - other people might want to know it. I gather that there is a similar vegetable growing in the UK, but not exactly the same. It may be called goosefoot or pigweed. I didn't know anything about it until it started turning up a few years ago - but it is a great flavor.